Once upon a time, Two bothers from our neighbourhood were one amongst the most feared people in the town. Everyone in the locality referred to them as rowdies. So to make it easy and no disrespect intended, lets call them "The rowdy brothers". Years rolled and many thrilling stories of their hassles and fights added to their credit. But one night all that changed. During an yearly fest in KREC (Karnataka Regional Engineering college) it is said that they had stabbed a man, after which, they were left with no other choice but to flee. One of the brothers went to Bombay and then, from there, flew to a gulf country. But the other remained in hiding until he was eventually caught. After several years, when I watched the film "Ulidavaru Kandanthe" it brought me back this story of the rowdy brothers. And perhaps thus, I could so easily relate to it. But if it weren't for my friend Sush, I would have never watched this film in the theatres. We always joke about Sush being allergic to Indian films. If one made a mistake of dragging him to a Hindi film they would never repeat that mistake. On his return he would review the film in the most humiliating manner yet filled with a masterful wit and great sense of humour that those who had not watched it, preferred his witty version. So when I received his SMS at 11:15PM on a saturday night saying that he was in a theatre watching a brilliantly made Kannada film, I could only consider it as an extend version of the dream that I might have then been in. But apparently that was not true. He having watched the film before us was very surprising and totally unacceptable to everyone in the office. So some of the colleagues decided to watch the film that following weekend. I must say, that I truly enjoyed watching a Kannada film in a theatre after a very long time. Growing up in the 80’s and 90’s, I had watched Kannada film industry deteriorate from bad to worse. In an industry filled with same old love stories retold, pathetic gangster stories and heavy vulgarity, there were limited choice for people like me. For years, I found myself clinging on to the master pieces by Puttana Kenegal. Thanks to the brilliant films made by Girish Kasarvalli, I got a taste of good cinema now and then. But the options were limited to off beat films such as Dweepa, Gulabi Talkies and Vimukthi. It is only recently that with the success of Lucia, a new breed of commercial films have entered the industry and "Ulidavru Kandanthe" takes the trend forward. The story of this film is very simple but the way it is narrated is what makes it very interesting. When a murder shocks the quiet town of Malpe in south canara, a journalist decides to report the events. But in her search for the truth, she is left with only bits and pieces of what others saw, and somewhere in their respective stories put together, lies the truth. The way the story unravels itself keeps the viewer at the edge of his seat yearning for more thrill and excitement. It is very rare to find a good script with an effective three act structure. Even with its creative narrative style, the film makes justice to every act. An effective use of a macguffin helps introduce the characters and build a plot around it. In this case the macguffin being a red bag that contains a valuable something. Several hints in the film prompt towards it being an idol of Lord Krishna. It is said that Sri Madhvacharya saved a few sailors from a treacherous storm and with them, found this beautiful idol of Lord Krishna covered in Gopi Chandana. 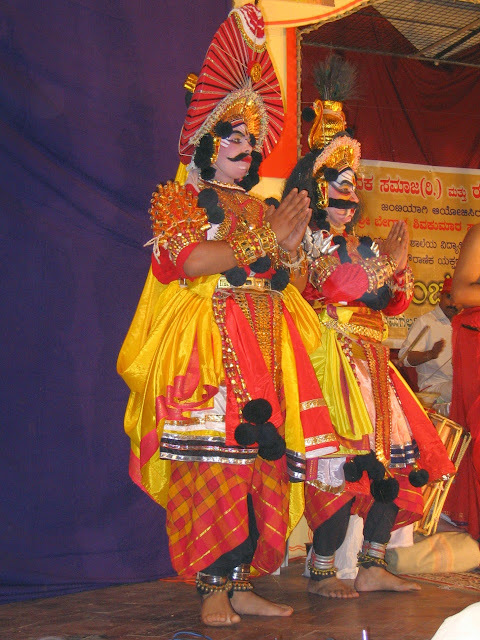 It becomes impossible hence to not derive a correlation between the story behind the Udupi Krishna idol and the sentiments depicted in the film. It is believed that Devaki while expressing her sadness of not witnessing her son’s childhood requests Lord Krishna to provide a vision of his days as a child. While Kirshna grants the wish requested by his mother, his wife Rukmini creates this idol of him that later for some reason travels from Dwaraka to Udupi. So one cannot help referring the mother-son relationship in the film to that of Devaki and Krishna. Kids running away from home is not something that is unheard of in South Canara. Again my neighbourhood had witnessed one such similar story. One of the eight children of our muslim neighbours had ran away from house for being scolded by his father. He returned all grown up, married and with a son after 20 long years. The whole town came to watch the family reunion. Furthermore, the macguffin seems to connect all the stories together. While the previous finding had brought wisdom and belief to the small town of Udupi; in this time of Kaliyuga, it had only brought death. This also hints at the social conditions of today as compared to the past, even in the presence of Democracy. The crow that follows Ballu would represent the messenger of death in this case which trails him since his finding of the macgugffin in the sea. As children, Me and my cousins would spend the evenings at the beach looking for exotic shells that sailed to the shore. On one such evenings we saw a beautiful shell that was much different from the usual ones. Me and my cousin happened to see it at the same time and we jumped at it together. So we made a pact that the shell would remain with me for thirty years and then I would hand it over to her. Since our childhood we always believed that the waves brought something special with it. As kids or as adults, we always enjoyed our hangouts in the beach along with our friends just like Richi and his friends would in the film. But a film is never just a script. It’s much more than that and in this film one does not fail to notice the technical brilliance. I particularly loved the cinematography that played extensively with light and shadows; reminding me of the clair-obscur effect in some of the Renaissance art. Every actor did his job perfectly and gave a believable performance. But no one would deny that the most loveable character in the film is Richi who stays in your mind even after the movie has ended. For that, all the credit would go to Rakshit Shetty for not only etching such a nice grey shaded character but portraying it in a much believable manner. Having seen the local goons in my neighbourhood it was very interesting to notice how much the body language, speech and attitude of Richi resembled that of theirs. You would see such characters in Mangalore and say "Aye malla punk ambe". While, there is also a tenderness and a mischievous touch to this character seen only when he is with his friends or the journalist. The rowdy brothers in our neighbourhood were a terror to the rest of the world but to people in our locality they were kind and generous. They behaved with humility with the women in our neighbourhood. My mother would not hesitate to ask them to carry back a few grocery while they returned from town, to which they obediently obliged. It makes me laugh now but perhaps most of us in our area felt safer in their presence. So having seen the two sides of the so called goons of our locality, it was so easy to see the transition in Richi’s character as he interacted with different people. But one of my favourite scenes from the film is when Richi kills his childhood friend and with eyes turned red, he describes his childhood in a line or two. In those few lines delivered effectively, one can feel the suffering and hatred that this character has experienced and perhaps still experiences. Coming of age is one of my all time favourite genres. Hence, most of my short stories revolve around kids or teenagers as this is the most sensitive time of our life; filled with many first's and surprises. How we experience our childhood and adolescence makes us what we are today. So to me, a touch of coming of age theme in the climax was more than a treat. But apart from being any other audience, I am also a Mangalorean and that made this viewing even more special. 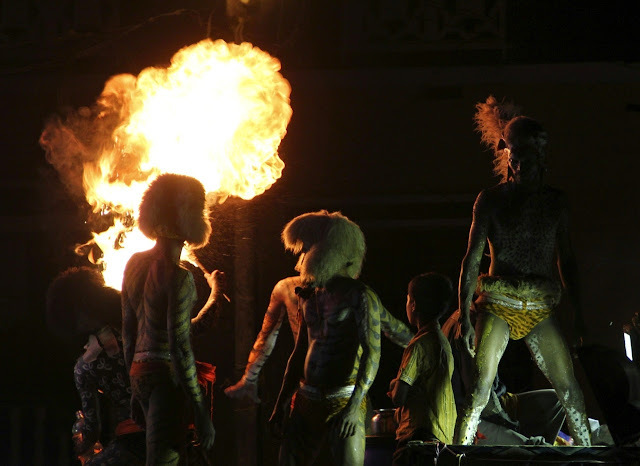 What impressed me the most in the film was its beautiful depiction of Mangalore culture. 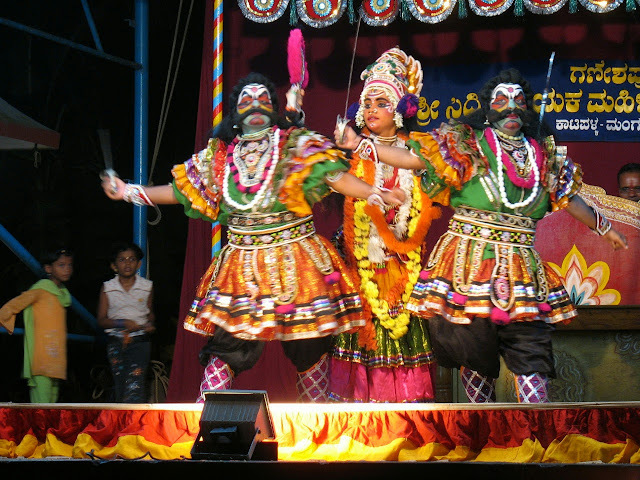 South Canara would be as lively and colourful as shown in the film during the 10 days of Dasara and one would see people dressed as various mythological characters or a tiger or a lion or a bear. I enjoyed even the minute details such as depiction of rain drops falling from the huts with roofs made of coconut leafs that we call "chappara." The shot where, Tara sprinkles water on the grinding stone to start making the curry paste reminded me of my mother and grandmother doing the same every morning. The charcoal stove that we call "Valle" took me back in time. The scene where the mother offers Jaggery and water to her son reminded me of how my grandmother would offer that as a first thing to any guest who came home. In one scene, Richi uses several objects to hit a guy. One of those objects is a "Kothalige" - Stem of a coconut leaf. This scene made me grin for a reason very difficult to be explained. As kids we would play with these kothalige as swords or make cricket bats out of them and we would jokingly call it as "kothalingey." To use it as an object to hit someone, I found extremely humorous. And of course there were the languages from South Canara! Friends helping each other with the itching. It is very interesting to notice that we speak around 6 different languages in South Canara but when we all meet, we speak Tulu. I was also happy to listen to Kundapura Kannada that is very close to the dialect that we speak at home (Kota Kannada). To listen to a full song in this language in the beautiful voice of Shreya Ghoshal was a treat. However, I felt that a bit more of Tulu would have enriched the experience. Today, I speak 5 different languages and I say without hesitation that among those, Tulu remains my most favourite language. While I lived in the US, I missed speaking in Tulu so much that I would call my friends in the east coast or in India just to speak the language. 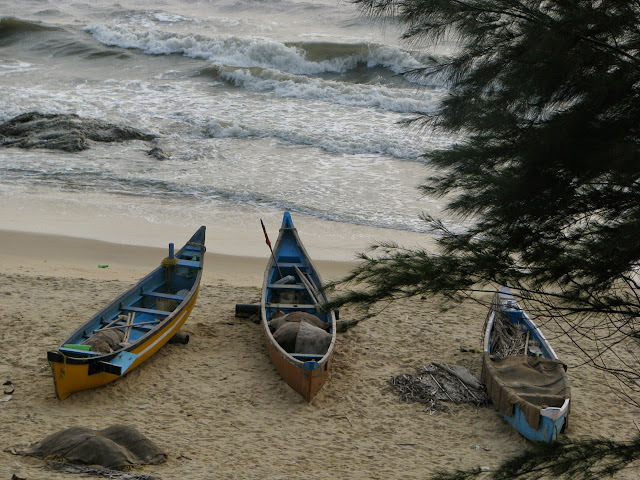 In spite of my immense liking for Mangalore culture and its breathtaking scenery, I also have my dislikes for some of the aspects of the same culture. Having witnessed two major communal riots in the late 90’s, I have disliked the way friends can turn against one another. Being born in a Brahmin family, I have witnessed extreme disparity between the castes. Not only between Brahmins and other castes but also amongst the other castes who have their own superiority and inferiority defined. During my later visits to Mangalore, I have witnessed a growing sense of possessiveness amongst certain people towards the language. One of the localites who overheard our conversation in a bus threatened my Bangalorean friend for talking loosely about learning Tulu. Another stranger to whom I requested to click our picture thanked me for speaking in Tulu that I found to be extremely weird. It would not be wrong to say that Mangalore is becoming heavily ethnocentric. I also dislike how we can get interferingly curious about others. However, it is equally true that no matter what we feel about our hometown it is just so much a part of us that we can never detach from it. We carry the local flowers, vegetables and cuisine where ever we go. 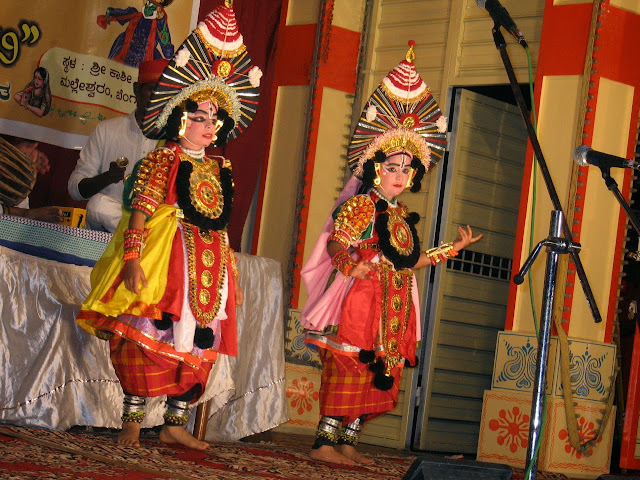 And for me, I notice a strong influence of South Canara culture in my paintings ( Bakthi & Nagamandala ) and my writings. Being so passionate about cinema and viewing it critically, it is impossible to close this review without mentioning certain points that I felt could have been different. 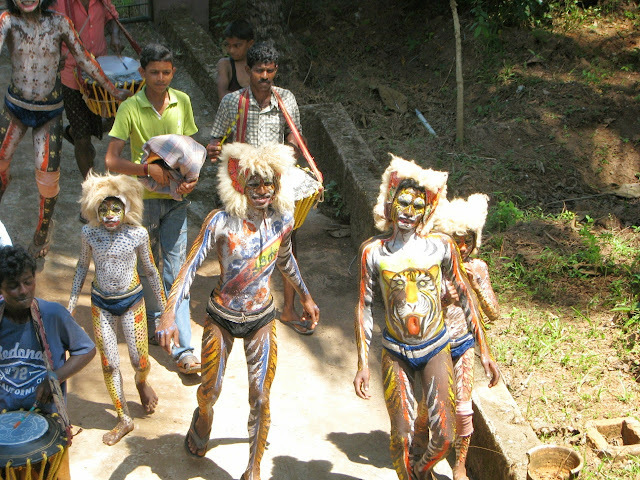 Coming from Mangalore, I could not help noticing the difference in tiger dance and colours. 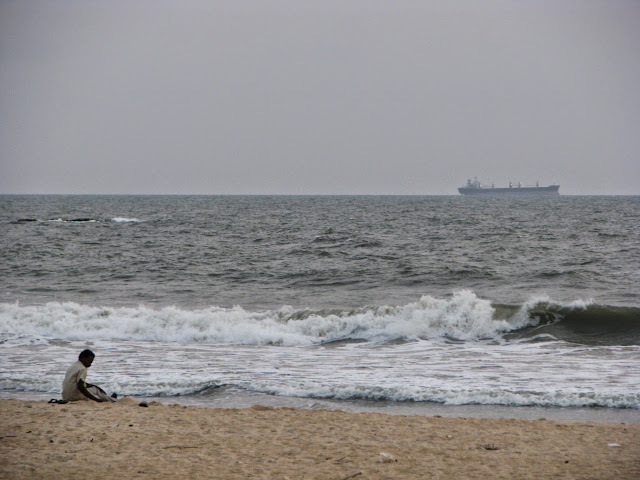 Mangalore and Udupi though share a similar culture, have some differences in the customs. 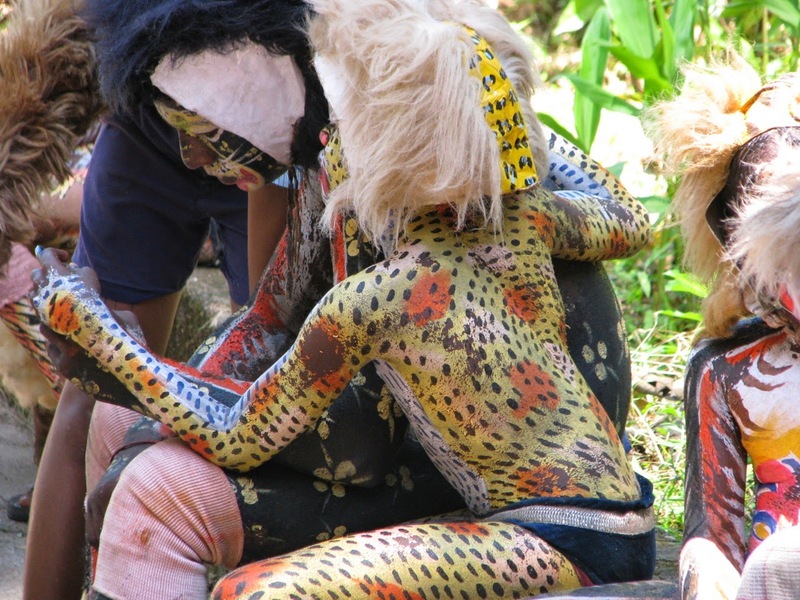 The tiger costumes I have seen are more colourful than just yellow and orange. The dance is a bit more aggressive down south than the one shown in the film. 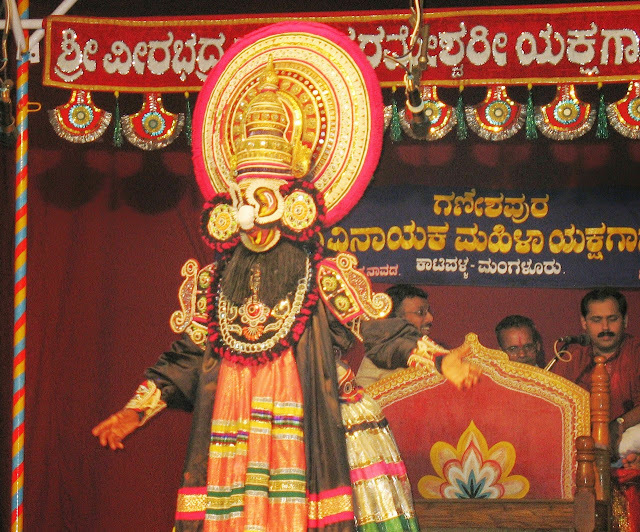 This always brings up a famous debate in South Canara between the two forms of Yakshagana - Thenkuthittu (Of South) and Badaguthittu (Of North). While Badaguthittu Yakshagana mainly popular in Udupi and North, is rich in its dance style and music; on the other hand, Thenkuthittu style of Yakshagana which is popular in Mangalore and South is much more colourful and aggressive. Me being an artist have always been attracted towards the fact that Thenkuttitu uses different costumes and makeup for every character. But these are just preferences based on what we have grown up watching. I also felt that certain scenes could have been crispier. These scenes seemed to prolong beyond the point where the emotion had already been conveyed. Specially during the mother-son reunion and the Crow following Ballu. At times I noticed heavy use of music to convey sentiments and sometimes a loud background music overshadowed few dialogues. A striking similarity between the irony behind Richi's death and the climax of the Hindi film "Jhonny Gadaar" was very evident. Nevertheless, they are just perspectives like the one’s in the film and everyone is bound to have their own perspective of a work. I hesitated to write a review of this film for so long expecting a need for further reflection on my part than just listing out what I liked or din't in this film as, in many ways it had evoked my childhood memories. It was during my recent trip to Surathkal, during the general elections that I got a chance to revisit my hometown after a long gap of six months and meet the people I had grown up watching. Everyone in our neighbourhood recognised me and greeted me with a smile and a few words of gentle enquiry of my well-being. "In this small beach town, everyday the waves cleanse the beaches. But the waves can’t reach everything, can they?"